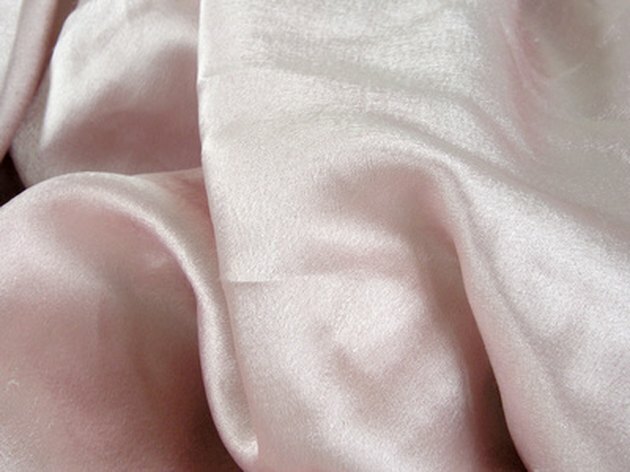 If your silk fabric develops an odor, it can be difficult to remove. Whether it's smoke or body odor, very few products are safe to use on silk, due to its delicate nature. You must balance properly caring for the fabric, while using products that can neutralize and eliminate the odor. Due to this, it may take several attempts to remove the odor from silk. Silk should only be hand washed to prevent damage. Sprinkle baking powder over the silk item. Allow it to sit on the fabric overnight. Baking powder works to absorb and neutralize the odor. Fill a sink or washing tub with cold water. Do not use warm or hot water, as it can damage silk. Add a mild laundry detergent and 1/2 cup of white vinegar. Submerge the silk item in the water mixture. Gently massage the fabric so it absorbs the cleaning mixture. Allow it to soak for 30 to 60 minutes, depending on how strong the smell is. Remove the silk from the water. Drain the water from the sink or tub. Refill with clean, cold water. Submerge the silk in the water. Use your hands to massage the fabric, working the soap residue from the garment. Do not run silk under running water. The force of the water can damage delicate silks. Lay the silk over a dry, clean towel. If the silk is white or light-colored, only use a similar colored towel. For example, don't use a navy or red towel with pink silk. Gently roll up the towel and silk, to squeeze excess moisture from the silk. Allow the silk to air dry. Repeat the process as many times as necessary until the smell is removed.